There are a great many things to do in Grand Cayman, and while the enchanting beaches may make weary cruise ship riders want to pull up a chair and take in the sights and sounds of the central island, there is so much more to do here than relax. Whether traveling with family, booked on a romantic getaway or looking for real adventure, the Grand Cayman cruise port serves as a gateway to all that the island has to offer. From historical insights and a look at the island’s collection of architecturally delightful buildings to opportunities to get wet and interact with some of the local sea life, cruises to Cayman Islands truly have something to offer every single visitor. There are some ports along Western Caribbean cruises that passengers simply stay on the ship for and let pass by, but Grand Cayman should not definitely not be one of them. We have put together a list of the ten best things to do at the Grand Cayman cruise port to help guests choose from the immense array of activities offered. 1. Stingray City Tours: No doubt one of the most well known tours in Grand Cayman are those involving the island’s beloved stingrays which are easily accessible along a sandbar boasting a mere three feet of water, allowing guests an opportunity to get up close and personal with the slippery and smooth sea creatures. Many Grand Cayman excursions stopping here allow visitors to touch and feed the stingrays while swimming freely about or snorkeling to get a good look at them from below. The tour offers a unique activity for guests aboard Western Caribbean cruises in that instead of just looking at the wonders below the water’s surface, a fully interactive adventure awaits them. 2. Turtle Farm: Animal activities are very popular on Grand Cayman, and after a dip with the stingrays, why not head to the turtle farm for another hands-on experience? Great for children and adults alike, even baby turtles are not out of arm’s reach here, and guests can learn about and experience rare living treasures found in this part of the world. Aside from turtles, the turtle farm also provides a glimpse at some of the area’s other local inhabitants including butterflies and even sharks. Families headed to the Grand Cayman cruise port will likely find the turtle farm a stop not to be missed. 3. 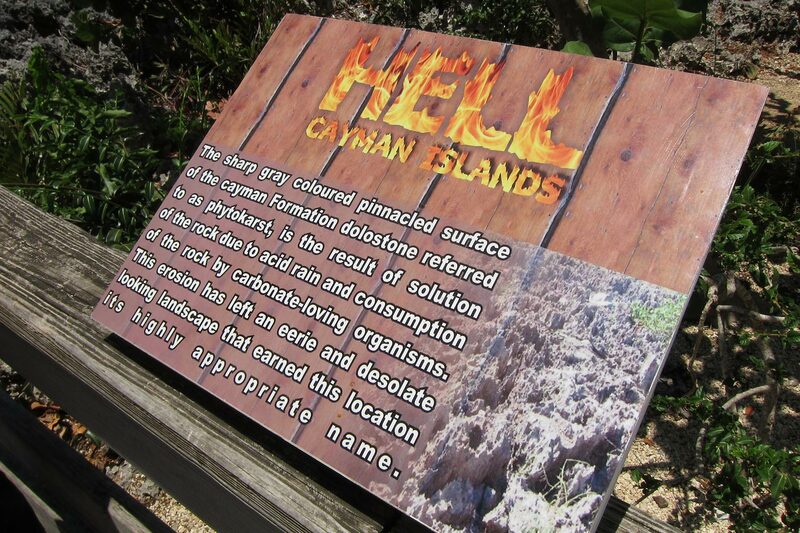 Hell: Going to Hell does not sound like stop many tourists want to take, however in actuality this is a very popular stop for visitors to Grand Cayman. Although there is little doubt that Hell’s gift shop serves as a tourist trap, offering trinkets for purchase and an over abundance of postcards, there is a legitimate reason to stop here, and that is the lava limestone formations that are truly unique and provide for some more than memorable photo opportunities. Few guests to the Grand Cayman cruise port miss a chance to stop in Hell, and they will even get a stamp in their passports to prove their trip to the tropical netherworld for friends and family. 4. Rum Cake Factory: One of the most well known desserts in all Caribbean cuisine is rum cake, and the factory found on Grand Cayman cranks them out for locals and guests to enjoy in delight. The factory tour shows visitors how the delectable dessert is made and of course provides samples to guests craving a sweet snack. Another benefit to the tour is that guests are provided an opportunity to ship their favorite sweets home right from the site, which is a plus for people with still many stops to go along their Western Caribbean cruises. 5. Semi Sub Tour Excursions: Semi subs combine the visibility of a glass bottom boat with the all encompassing grandeur of scuba diving down below into an air conditioned ride that is peaceful, relaxing and informative. It provides an excellent opportunity for families traveling with children unable to take advantage of scuba and snorkel options from the Grand Cayman cruise port a way to see all the vibrant and exciting sea life below. 6. Catamaran Tours: Catamarans are an exciting way to get around the close waters of the island. Most of these Grand Cayman excursions take guests to familiar destinations like stingray city, area coral reefs and underwater shipwrecks where snorkeling is encouraged. The catamaran ride itself however often proves an immense delight and refreshments on board make getting to the destinations often as enjoyable as they are themselves. Getting back on another boat following de-boarding at the Grand Cayman cruise port may seem counterproductive, but it’s an exciting, open air means of transportation that is well loved by visitors to the area. 7. Kayaking: What makes kayaking around Grand Cayman unique are the forests of mangroves that guests enjoy weaving around while paddling their way to a physically challenging yet visually engaging adventure. Kayaking may be too dangerous for small children as there is an inherent risk of tipping the kayak, however for adults that don’t mind a little excitement, the tour offers a less relaxing look at the island from a different perspective. The tour gives way to a brief snorkeling opportunity before heading back, and is very reasonably priced compared to many other bookable options from the Grand Cayman cruise port, priced at around forty dollars per person. 8. 4 X 4 Jeep Adventure: A great combination of fast paced sightseeing and bumpy off-roading provides a perfect blend of serenity and adventure for travelers here looking to get off the beaten path. The tour comes complete with knowledgeable and witty guides who make exploring guests feel like family all along their journey to the beach front. Grand Cayman is home to some of the best beach vacations in the world thanks to unspoiled natural beauty and exotically hued waters, and ending an off road adventure with some time to unwind at the beach ensures that guests get the best of both worlds during their time on the island. 9. Luxury Yacht Tours: By far and away one of the most expensive and opulent Grand Cayman excursions available, tours aboard a luxury yacht are worth the money according to past visitors who see nothing at all wrong with getting off their big ship and on to a smaller one. Perhaps this is because it is no ordinary boat, boasting modern features and a richly detailed interior and exterior, and guests fortunate enough to book these private excursions will get to experience Grand Cayman in the lap of luxury. It’s not just about riding on an incredibly fancy sea-goer however, and like many excursions booked at the Grand Cayman cruise port, snorkeling is an option that many take advantage of while on board the luxury liner. 10. Pirate Encounter: The Caribbean is synonymous with pirates, and while not every stop along the path of Western Caribbean cruises embraces the pirate culture, Grand Cayman celebrates it in full force. An authentic replica ship that bears every hallmark of the ones that swashbucklers captained centuries ago takes guests right out into the same waters that the pirates explored for a fun and historical way to explore the area from the perspective of some of its earliest visitors.